Hi everyone, Audrey here. The holidays are quickly approaching, and if you're anything like me, you may be keeping your eyes out for some fun and different gift giving ideas this year. 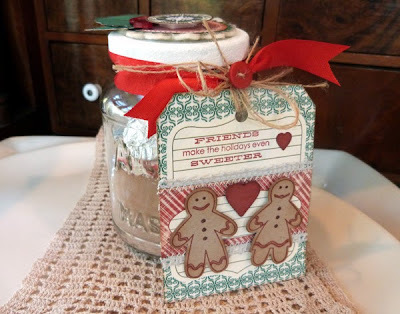 Today I have just such a project to share with you that's quick and easy to make, works for practically everyone on your gift-giving list, and doesn't cost a lot to put together. A definite plus in my book. I love giving handmade sweet treats and food items at the holidays, and this hot cocoa treat set is a holiday favorite. A simple cocoa mix is super easy to put together, and goes a long way. 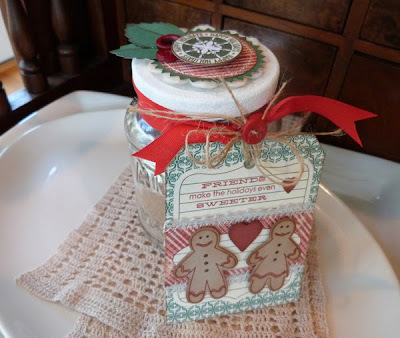 By adding a few extra treats like marshmallows, crushed peppermint candy, and chocolate, and packaging the whole in a pretty gift jar, you turn a simple gift into a showstopper. Thoroughly wash and dry a recycled glass jar. 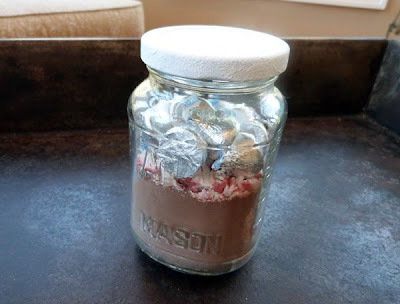 Paint the lid of the jar white and then fill with hot cocoa powder, crushed peppermint candies, and Hershey Kisses. 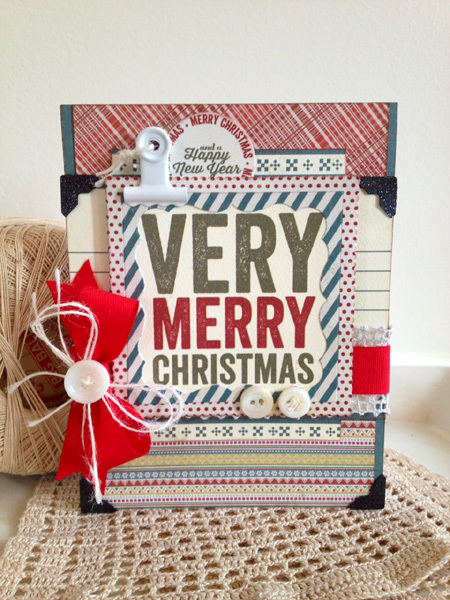 Die cut a variety of circles from the 6x6 Bundle papers and fleece fabric, adhere them together, and machine stitch around the edge. 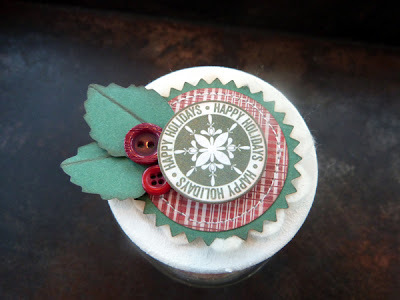 Affix circles to the top of the lid using strong tacky glue or hot glue. 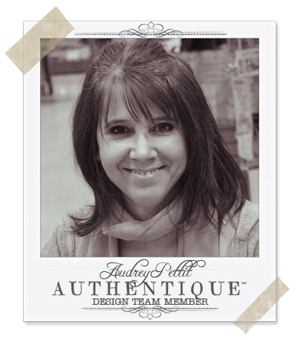 *Note: for a shabby, vintage look, I edge all paper and sticker pieces with brown ink. Adhere a circular cardstock sticker from the Elements Sticker sheet to the lid using foam adhesive for dimension. Die cut a pair of leaves from green solid Bundle paper and tuck under the sticker. Add a pair of red buttons. Trim a journaling card from the Enhancements Cut Apart paper. 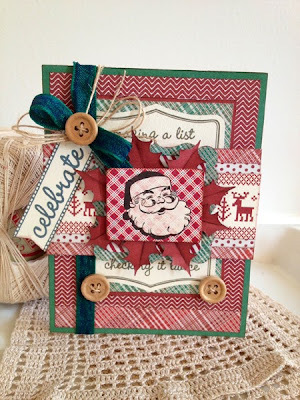 Cut off the top two corners and punch a hole in the center of the top to create a tag. 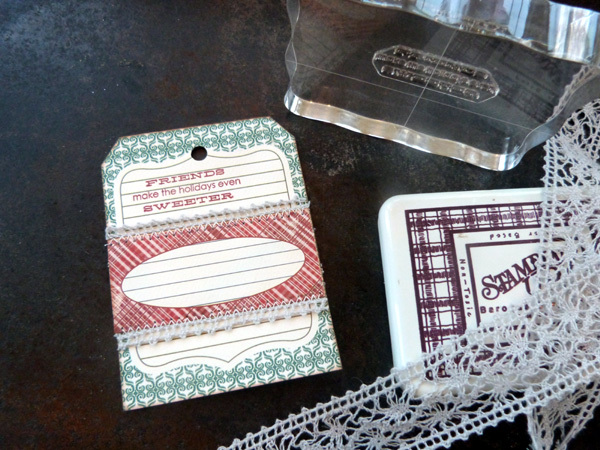 Stamp holiday sentiment onto the tag using dark red ink. Trim a smaller journaling block from the Enhancements sheet and adhere lace trim to the top and bottom edges before affixing to the center of the tag. Machine stitch the edges. 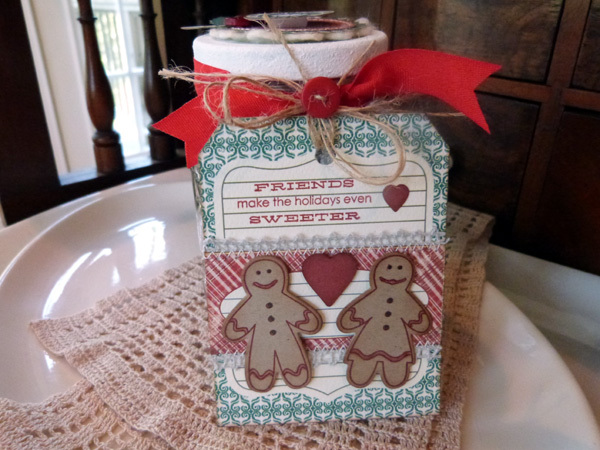 Die cut gingers from kraft cardstock and hearts from red solid Bundle paper. Stamp matching ginger images and lightly color with markers. Adhere images to tag. Tie trim around the top of the jar and attach the tag with hemp twine. Add one final red button to the center of the bow. And while I had my supplies out on my worktable, I put together a couple of fun holiday cards using Tradition 6x6 Bundle Papers, Elements Stickers, and the Enhancements Cut Apart paper. The adorable vintage Santa on this first card is from the Joyous collection. Lovely - thanks for the inspiration! 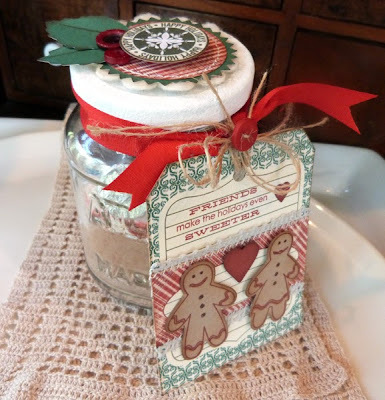 I could make a jar like this for myself, it's very handy and looks cute! Very cute gift package. 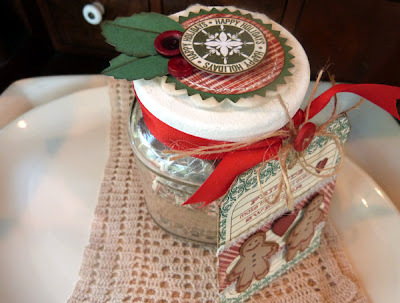 Love the tag and that the jar has been recycled makes it even more appealable as a gift. This idea is interesting to me. I just thought how to decorate a birthday gift jar. Thanks for the idea! Postcards are great!